The best news for Republicans is that Democrats are in such worse shape. Tales of supposed political unity abound in recent days, following the election of former Obama administration Secretary of Labor Tom Perez to be the next chairman of the Democratic National Committee and following President Donald Trump’s address at this year’s CPAC convention, the first time a president has addressed CPAC in his first year in office since Ronald Reagan 36 years ago. Perez, supported by the Clinton/Obama wing of the Democratic establishment, won a second-ballot victory over the Bernie Sanders/Elizabeth Warren-backed socialist Muslim Congressman Keith Ellison (D-MN), a man who would have been an even better choice than Perez, though not by much, if the Democrats’ goal were to make themselves a party with even narrower appeal than it has now. As of June 2016, there appeared to be nothing but storm clouds gathering over the issue of Internet liberty. Then, in January, out of nowhere, came a ray of hope… Whenever you hear the word “neutrality” thrown around by politicians and “experts,” especially when talking about the need for new regulations, you should automatically think “is a myth.” Conversations about net neutrality can become complex. Writers throw around technical terms, like “traffic shaping” and “over-provisioning.”.............Pareto’s law: 20% of Comcast’s users were consuming 80% of the available bandwidth. The other 80% of its Internet users were probably only consuming 20% of its bandwidth. My Take - Once again we see the left "framing" another issue with phrases that mean something entirely different than the intent. George Orwell called it Newspeak or Doublethink with the goal of using words to give one impression when the goal is diametrically different. A deliberate attempt to disguise and distort the truth and hide real the intentions of those pomoting it. "to be conscious of complete truthfulness while telling carefully constructed lies, to hold simultaneously two opinions which cancelled out, knowing them to be contradictory and believing in both of them, to use logic against logic, to repudiate morality while laying claim to it, to believe that democracy was impossible and that the Party was the guardian of democracy, to forget whatever it was necessary to forget, then to draw it back into memory again at the moment when it was needed, and then promptly to forget it again, and above all, to apply the same process to the process itself – that was the ultimate subtlety: consciously to induce unconsciousness, and then, once again, to become unconscious of the act of hypnosis you had just performed. Even to understand the word 'doublethink' involved the use of doublethink." "is language that deliberately obscures, disguises, distorts, or reverses the meaning of words. Doublespeak may take the form of euphemisms e.g., "downsizing" for layoffs, "servicing the target" for bombing, in which case it is primarily meant to make the truth sound more palatable. It may also refer to intentional ambiguity in language or to actual inversions of meaning. In such cases, doublespeak disguises the nature of the truth. Doublespeak is most closely associated with political language." My Take - The truth of the matter - or at least this is the way it seems to me is - she's losing it. Me too.....I'm 70 and I'm noticing I've developed memory problems. People who know me are generally amazed at my memory, so they laugh when I say that. But I can tell I'm having problems and I can also tell it's getting worse. Compared to most at my age, I'm not doing badly, but it's clear to me it's happening. Ginsberg should never have been appointed in the first place. As a former ACLU attorney she's consistently been "political" in her decisions, she was able to hide it. But she's getting old and old people get stupid. Perhaps stupid isn't the right word to describe what I think is happening. When we get old we really don't care all that much for what others think. When that happens our judgment gets side tracked.....then we get stupid. It would appear she's going to be just like Thurgood Marshall who was almost drooling at the end. As I watch excusers of Islamic thought and violence being interviewed I find one thing that is consistent in their comments - they never answer the questions they're asked. They obfuscate, change the subject, accuse those asking the questions of being insulting - but they never answer the question. In short - they lie by any means possible, meaning they're deliberately trying to get the public to believe things that aren't true, including claiming Islamic violence is a direct result of the west killing "millions" of innocent Muslim civilians and the west's constant interference in the Muslim world. First, it was Islam that invaded Christian lands and all the Crusades were a direct result of Muslim aggression and "interfering" in the lives of Christians and the western world. Secondly, where does this number of "millions" of innocent "civilians" come from? Below is a list of articles appearing that brings home what Islam is all about, and it's not a religion. Islam is a criminal political organization masquerading as a religion. The fact they've done so for 1400 years is immaterial. But they, like the Mafia and other organized criminal organizations, do so through the persuasion of fear and violence, not they persuasion of thought or intellect. As the Canadian Parliament prepares to adopt a motion condemning "Islamophobia," the Canadian media have shifted into high-gear propaganda mode to smear all opposition to this anti-free speech measure as hysterical. Leading the charge in the Toronto Star is Faisal Kutty, who teaches law at Valparaiso University Law School in Indiana and Osgoode Hall Law School in Toronto and has numerous ties to groups linked to Hamas and the Muslim Brotherhood. Kutty leads off by scapegoating me as the "lunatic fringe" opposing this thought-crushing measure...........Kutty also tries to lull Canadians into complacency when he falsely claims: "There is no monolithic understanding of the Sharia. Like any world view it can be used and abused by people with varying agendas. Developed over 1,424 years in diverse societies, it has manifested itself in a range of views. In fact, the inherent diversity and pluralism of the Sharia may be the best tool we have to counter the violent and antimodern narratives of extremists." France’s attempts to deradicalize jihadis have been a complete failure, a parliamentary report reveals. My Take - For the record....I was never impressed with either of the Bush's. It was obvious Bush I wasn't a conservative, and I had misgivings about Bush II, which he dispelled quickly....he wasn't either. And when he called Islam a religion of peace..... I knew the libtards were right.....he really was as dumb as dirt. I also think he, just like others, was in cahoots with the Saudi's, because of oil. Which is diturbing because all we had to do was....drill, and we wouldn't need them. With fracking we now know just how true that was. So why should we be shocked when his daughter supports infanticide. After all, her mother supported it saying abortion should “remain legal, because I think it’s important for people, for medical reasons and other reasons.” So much for the Bush's lauded Christianity. Let's try and understand this. As William F. Buckley said: There's only one reason to support abortion: you don't believe it's murder. There's only one reason to be against abortion: you believe it is murder. If a person claims to be a Christian and supports abortion - that person supports murder and is an heretic. It's just that simple. And Jeb and the Republican elite wondered why conservatives didn't support him. There's a side benefit of Trump's election that's not been talked about. I don't see Karl Rove and his chalk board charts on Fox anymore. When Steven K. Bannon commissioned yours truly in early 2015 to write the Breitbart series "Rove-Stupid," based on the 2013 book about Rove and the establishment, I realized that there was someone who loathed the Republican establishment even more than I. Previously, I was not aware this was even possible, but Bannon is like that. Daily Mail, The Sun UK and The Mirror UK have all reported on a Migrant French Couple with 8 kids that has refused a FREE 5 bedroom home. Not only that, but they have refused a total of 3 homes offered to them. They are currently residing in a 4 bedroom apartment; one bedroom is being used as an office. The parents each have smartphones and a laptop. There is a 60 inch flat screen TV and Sky HD box in their front room, plus a 52 inch television in their bedroom. Their children also have a TV and an Xbox with dozens of games. I guess that is where the nearly $55,000 they have received in government money has gone. “A thorough external review of the polar bear status issue is now required - not only because it’s the right thing to do but because it may help restore public support for science and conservation,” Dr Crockford said. Klayman: Keep It Up Leftist Hollywood - the More You Mock Trump and Conservatives the More Your and the ACLU's Politics Will Lose! Klayman: Don't Think Politics Did Not Play a Role in La La Land Losing Award for Best Picture! Typical Hollywood! More of the same coming up? Here’s a variation of a joke I heard recently that is circulating among conservatives. The pope and Trump were out on a ship and suddenly a gust of wind causes the pontiff’s hat to fly several feet away from the boat on surface of the water. Trump gets out of the boat and walks on water to retrieve the miter. On a nearby boat are members of the media. Anti-Second Amendment liberals care nothing about your welfare or safety. If they had their way, you would be left defenseless in your own home. 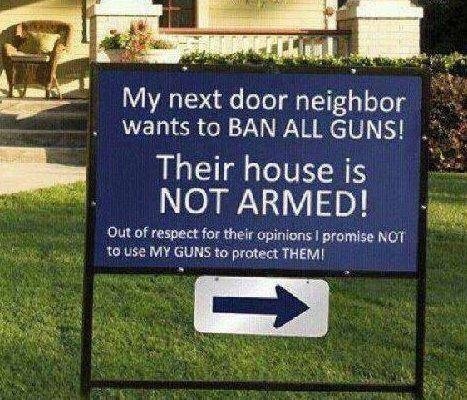 I’ve asked many anti-gun advocates what they would do if someone broke into their home and attacked their spouse and kids. When pressing the issue, many finally admitted that in such a situation, they would want some means of protection or self-defense, up to and including a gun. Earth’s climate is likely changing somewhere, as it has throughout planetary and human history. Our fuel use and countless other human activities may play a role, at least locally – but their role is dwarfed to near irrelevance by powerful solar, oceanic, cosmic ray and other natural forces. Moreover, real-world ice, sea level, temperature, hurricane, drought and other observations show nothing outside historic fluctuations. Unprecedented disasters exist only in the realm of hypotheses, press releases and computer models. Klayman: Good for President Trump. The WHCD is hosted by a bunch of self aggrandizing leftist media snobs who have a false sense of self importance! Klayman: Well said by my good friend Ben Stein on leftist media's attempt to destroy President Trump! There is no doubt that Mr Trump's policies have tended to make Muslims and Hispanics feel unwelcome but that is just a reflection of the fact that Muslims and Hispanics have made themselves unwelcome by their egregious behaviour. If Amnesty wants to seen as more than a Leftist propaganda mouthpiece they will have to start looking at both sides of the matter. This article, Global Rights Group Accuses Trump, Others of ‘Politics of Demonization’, by Patrick Goodenough notes: The Left-leaning Amnesty International has accused President Trump and other “anti-establishment” politicians of “wield[ing] politics of demonization that hounds, scapegoats and dehumanizes entire groups of people to win the support of voters.” “Donald Trump’s poisonous campaign rhetoric exemplifies a global trend towards angrier and more divisive politics,” Amnesty International said in a new annual report covering 159 countries and territories. A Washington post editorial, "Breaking the unwritten rules of governing", criticizes Mr Trump's firing of Sally Yates -- an Obama relic heading the Justice Department -- when she refused to do her job. What was he supposed to say other than "You're fired"? Once again the Leftist rag is preaching the highest standards of civilized behavior -- oblivious that the Left themselves constantly do the opposite. They have the brass to say that we should not demonize political opponents. So "Trump = Hitler" and all the rest is wrong? It certainly is but the Post does not mention that. At least one swamp appears to be being drained. "It's a bloodbath at the State Department," the New York Post hyperventilated last Friday: "Secretary of State Rex Tillerson is cleaning house at the State Department, according to a report." In Donald Trump's America, so much has happened so quickly to set the nation on a course decisively different from the one it was on during the regime of his disastrous socialist internationalist predecessor that this particular bit of good news was largely overlooked. A myth that many Americans as a whole buy into is that slavery was about being a skin color - Self-limiting pursuits that serve only to retard personal growth and reject modernity have plagued blacks in America uninterrupted, in the form of identity politics, since the collapse of the oppressive eras of subjugated inequality, i.e., slavery, the Ku Klux Klan (KKK), and Jim Crow laws that were instituted and maintained by the Democrat Party. Perhaps one of the most overlooked, indeed most unknown facts is that blacks were not brought to America as a color. That is a difficult fact to digest for those fixated upon being a color. It is the deadly truth those making an industry out of marketing skin color do not want known, and/or understood because it threatens the skin color narrative. Specific to said point, if that understanding is embraced, then it logically follows that people will begin to question when and why did skin color become important? Africans were hunted, captured, and sold as a form of commerce, just as slavery was with every other group of people spanning history beginning in the Old Testament Book of Genesis. People were not selected to be slaves based upon skin color, they were conscripted into slavery vis-a`-vis war and/or commerce, which understandably resulted in people being born into slavery. I have argued many times that the Civil War wasn’t fought based upon the skin color of the slaves. Slavery was only a tangential reason for fighting the Civil War. The primary reasons had to do with state’s rights versus what several Southern states viewed as an overreach of federal authority in violation to the Constitution. Other causal factors included expansionism and nationalism that led to calls for Southern secession, which the Northern states were unwilling to abide. These factors, while not exhaustive, played a large role in launching America into war with itself. Specific to that point, skin color only became the issue when the Democrat Party employed same as a means to continue slavery and as a reason to punish “free Negroes” for supporting Republicans. This fact was attested to by “free Negroes” themselves: The “inhuman outrages” perpetuated upon African Americans in the South were largely committed through the Democrats’ Ku Klux Klan. It is indisputable historical fact that the Klan was started by Democrats. In fact, during congressional hearings on the subject, one prominent Democrat testified that the Ku Klux Klan “belongs to . . . our party – the Democratic Party.” And the first Grand Wizard of the Ku Klux Klan was prominent Democrat Nathan Bedford Forrest, an honoree at the 1868 Democratic National Convention. Recall also that every Democrat in Congress voted against the 1871 bill to punish Klan violence (See note about this bill on Pg. 8; Democrats and Republicans In Their Own Word). Book Review: The Absent Superpower, The Shale Revolution and the World Without America. The media portrays the affirmation of the First Amendment in the Trump CPAC speech. Today I've linked a number of articles dealing with the "fake news" and "The media is the enemy of Americans" issue surrounding President Trump. Of course the media is outraged - they're finally being called to task by someone everyone has to listen to - the owner of the Bully Pulpit - The President of the United States, Donald Trump. He's called the media scum. So have I and many others over the years. He's called the media America's enemy. So have I and many others over the years. He's called the media liars. So have I and many others over the years. And the list goes on. But when newsies like me - and all these others - exposed their craven mendacity it may had some effect, but how much can only be guessed at. While we may have gotten others to see what we've been seeing for decades we couldn't change a thing as long as the leadership play the game by the media's rules, i.e., they decide what's important, who's important, what's news and what's not news. In short - someone is finally saying to them - you don't have the power to control the message by lying and get away with it any longer. And that someone is the President of the United States who doesn't care one whit whether the media likes him or not. Mostly because he's smart enough to know no matter what he does they're going to hate and villify them. And he understands appeasers are like the prey eaten by crocodiles. He doesn't want money - he has more than he or his family can spend. He doesn't want more power because he's got all he can handle. He doesn't want prestige or he would have stayed out of this. He doesn't want position because he is the "position". And it's clear by his actions none of these things are of concern to him after he's out of office. I never liked Trump. From the beginning of this election cycle I dismissed both he and Bernie Sanders as "perpetual" candidates looking to get some publicity. And that's what they were. Both of the were as shocked as I when it looked like they actually had a following and could take their party's nomination. We now know that couldn't happen with the Democrats because it was rigged. But it was possible in the Republican Party, and it did happen in the Republican party, the party the media hates. Not the party of rigged elections, but the party that allowed someone the leadership despised to become it's nominee because the "people" of the Republican party decided who was to be the nominee, not the party leaders. And they picked a nominee prominent Republicans repudiated, and a number of them - including George Will - even wanted Hillary to win. I said back then: Tell me how a man treats his wife, and in this case wives, and I will tell you who he is. Well, I really hate being wrong, but I also hate not admitting to being wrong. As I'm fond of saying.....that was a logical fallacy. First, his life was an open book so he didn't have anything to hide and his reputation couldn't have been worse. Secondly, I didn't take into consideration a man who was unstable in his married life can still be successful in business. If a man can be successful in business, he can be successful in politics, because both require good acting skills. He never expected to be where he is and when it became obvious to him he might actually win the Presidency, I saw a change. He's now come to believe he can save America from the socialists who've been working to destroy the Constitution, American capitalism and the nation. An ongoing effort since Stalin sent his agents here to do so in the 1920's, and the Democrat party with FDR was instrumental in that infiltration. That infiltration included the newspapers, radio, Hollywood, the unions, academia and every department of the federal government, including what became the CIA. Are you ready for this? McCarthy was right. His numbers may have been off, but based on what we know from the VENONA intercepts, perhaps not by much. One more thing. McCarthy's Senate committee only looked into communist infiltration of government. It was the House on UnAmerica Activities Committee (HUAC) in the House run by the Democrats who went after Hollywood. Do you see the pattern? McCarthy has been vilified for decades by the Democrats and their propaganda machine - the main stream media in the fifties, but actually the corruption goes back to before WWII. During the war they even promoted Stalin and Russia as allies against Hitler, easily forgetting they were collaborators of Hitler invading Poland, the Baltic states and Finland. Donald Trump has taken them to task and they're outraged at being exposed as "alcoholics" of news. Addicted to the power, prestige and privilege that's been bestowed upon them by themselves. That's over with. With the exception of Reince Priebus, White House Chief of Staff, the Trump team won't play their game. Trump's team is going to lay down the rules and the media will play by them or be out. The main stream media is toast and the so-called alternative media is going to become transcendent because the alternative media doesn't need Trump and will say what they believe to be true without concern about pride, prejudice or privilege. Trump reminds me of me - "It's not about me, it's about the mission." And part of his mission in saving America means destroying the traitors, liars, and charlatans of the media. And the idea of a man who's played the clown saving America must he heady stuff for him, and that's how he sees his place in history. The President who saved America. With that as a goal: who cares what the media thinks? One more thing. For those of us who remember when Reagan fired all the air traffic controllers we remember the media's, and the Democrats, outrage. Reagan won, even against advisers in his own party and administration - and the net result? The postal workers, who threatened to strike, didn't, and world leaders realized they were facing a real man who was not to be taken lightly, and the Soviet Union collapsed. Don't kid yourself. The world's leaders were aware Obama - and his administration - on their best day had a backbone of spaghetti and the mental and intellectual discipline of a child. The world's leaders understand Trump and his administration is made up of adults who are smart, knowledgeable, tough and fearless. America's greatest threat durning the Reagan years was the Soviet Union. Reagan's goal was to defeat the Soviet Union and he made compromises with the left in order to do so. The world is going to change, and the left, which has been a threat to the nation for over a hundred years, is now the number one threat to the nation's continued existence. Just as Reagan bested the air traffic controllers and brought down the Soviet Union, Trump is going to have to face down the media because his goal must be to defeat the left. Trump must stay the course and expose the media for whom and what they are in order to accomplish that mission. Her assertion that Trump is undermining the free press is not original. A Google search for the string “Trump undermining the free press” returns over a million links. One of them is to an opinion piece in “Newsweek” published toward the end of December. The author is Robert Reich, secretary of labor under Bill Clinton and current political commentator at large. Project Veritas‘ James O’Keefe appeared on Sean Hannity ‘s radio show on Monday and has warned that he would release “hundreds of hours” of tape from inside the establishment media, and it seems that particular media group is CNN. Here’s how the important portions of the Hannity interview went.